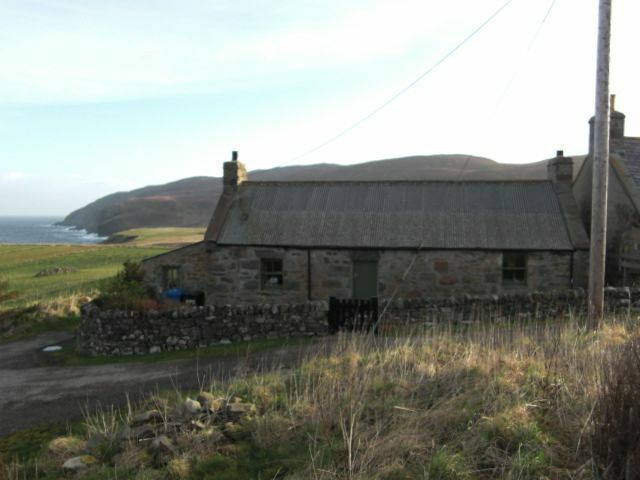 Kips Cottage is a rustic former bothy, with very few mod cons, other than amazing views and copious hot water. If you love going back in time and feeling like you are living on the edge of the world, it will be perfect for you. If you are looking for something even vaguely modern, Kips Cottage may not suit. The cottage is situated in a stunning location just off the North Coast 500 in Sutherland. The cottage looks over the North Atlantic and is surrounded by hillside with fantastic views of the changing coastal scenery. There is a spacious living area with a sofa and 2 armchairs, and a pine dining table and a wood-burning stove at one end. A charming double bedroom is accessed from the other end of the living space. Also on the ground floor is a basic kitchen, slightly like being on a boat, with a kitchen table and French doors out onto the decked area outside. The kitchen has an electric oven and a butler’s sink. Situated off the kitchen is a charmingly ramshackle bathroom with bath and basin and lavatory. Up some steep stairs by the kitchen is a long attic area with twin beds at one end. The attic has limited headroom and is perfect for children. There is plenty of parking and a garden to explore. Let Saturday to Saturday, but other changeover days considered in low season. Kips Cottage is a home away from home. An escape from the rat race, for beaches, surfing, swimming, walking and exploring wild places. The perfect place to recharge and spend time together. Family of four stayed for four nights. Great to be off the grid and away from it all. The weather behaved itself for the duration. Wonderful scenery, already we are considering returning again in the future. A peaceful place to stay....far from fast life ! We can’t wait to be there again soon! Delivered exactly what it offered: Beautiful remote location, but not too far from a village. Basic facilities, but mostly everything you needed, (apart from a few light bulbs). Fantastic views of the sea. The wood burner took the place of the TV and was all the better for it. Quiet and peaceful. Rustic and basic but that’s how we like it. Small cottage but with everything you need for a short break, comfortable and clean with lovely views to the sea and cliffs. I would love to thank you to Robyn for allowing us to stay in such an amazing place! There is no words to describe how lovely and peaceful this place is! View is amazing. I wish i could stay there forever! With no hesitation i would recommend Kipps Cottage to anyone who is looking to spend some peaceful time away from busy city life. The area is an outdoor paradise with mountains to climb, fish to catch, beaches to roam, waves to ride and wildlife to spot. There are several rivers within a short drive – Naver, Borgie, Strathy and Halladale - all which offer good salmon fishing and also there is a myriad of lochs, streams and estuaries to explore.